1. No TV screen in the car? No worries! 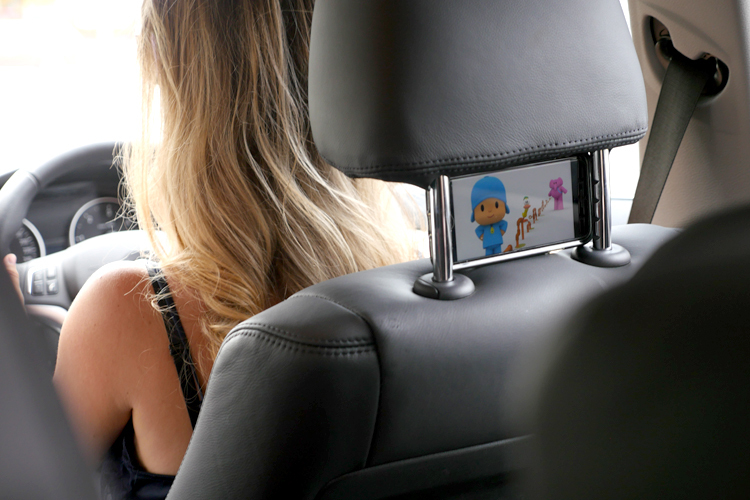 Yep, hubby got me on to this sweet little trick – all you have to do is put the head rest up, wedge your phone in and get the youtube going! This little nugget has got us through many a long car trip, especially the last 20 minutes when nothing seems to work. (Oh, praise youtube). 2. I do heaps of batch cooking in our house, it just makes dinner time way more manageable and it especially makes Remy’s baby food quick and easy (I mean, who wants to be steaming and pureeing every few hours?). The only problem with this is when I over microwave some of the food (so easy to do when they are small portions) but you have a hungry child who needs to be fed immediately. So mostly I would just sit there and wait and hope that it cooled down really quick. But hubby knows the lay of the land and showed me that all you really need to do is 1) switch the food in to a new cold bowl, and 2) if you really want to speed up the process, put the food into a bigger bowl or plate. And voila the food cools down twice as fast! (Can I just say, this probably seems super dooper simple but not once did I think of it before I was shown). 3. I overhear hubby doing this one all the time, in fact I’m pretty sure he does it every bedtime! Austin loves his bed time books but however many you read it is never enough. So every bed time even though hubby has full intentions of reading 3 books, he always says ‘last book’ before book number two – then when he ‘caves’ for one more Austin thinks he has won the book time battle! I wonder how old Austin will be when he cottons on to this little trick? 4. As a general rule if the dishes are in the dishwasher they will be cleaned. That’s right. Get ready to get over your OCD because they don’t have to be in the right shelf, height order, rinsed or scrubbed before you put them in... yep, you heard correct! No re-stacking for the second time and you will still get sparkly clean dishes at the end. (In all truth sometimes there might be one dish that is not completely clean but I don't even care! I just leave it in there for another cycle. I know, I'm crazy right?). 5. Pyjamas are nice but not necessary. If your child falls asleep earlier than expected, or is simply being fussy (or downright difficult) at bedtime, there really is no need to kill yourself trying to get the jammies on your toddler. Chances are they won’t even notice, or if they do they couldn’t care less. 6. If your child is old enough to communicate and is not saying ‘I’m hot’ or ‘I’m cold’ or thirsty or hungry or anything else... it is perfectly fine to just let them be. They will let you know if they need something. (Yes, this also doubles as a personal note to self as I am forever checking in on the kids to see if they are 'ok'). 7. Do things beyond your kids current abilities and push those boundaries. So often I see my hubby trying to do something with the kids that my immediate thought is ‘Stop! He can’t do that yet!’ and luckily I’ve bitten my tongue because some of these moments turn out to be the best! Throwing the kids in the air, playing wrestling games (like REALLY wrestling) and general craziness gets the BIGGEST laughs from them and I can honestly say the kids have the best time. Encouraging the kids to do things they can’t yet (when I might be hesitant to avoid it until they are ‘ready’ to prevent injuries or tears) has shock, horror, never ended in disaster. It’s just encouraged them and started them on their next little learning journey. Go dad! So, thanks for the learning curve Daddy-o, it seems sometimes the best mum hacks, were created by dads.